We Ascended on the Breath of Life and the Breath of Spirit, Knowing the Truth of our Power to Manifest a Creation of Unconditional Love. Today we begin a new cycle of “Light.” Holding the Wisdom of our Power to Create, we are guided to Dream Again, as the Dreamer Who Believes the Dream will come True. Night/AKBAL marks a cycle of Divine Inspiration, “Light,” that Speaks to us through our Dreams. Through the manifestation of Higher Consciousness, we are made capable to Hear the Voice of Spirit. AKBAL connects the Conscious and the Unconscious, the Intellect and Intuition, to unite our faculties for Divine Discernment. Residing in the West, AKBAL will speak a language we will Know as Divine in our Heart. Through the power of our Intellect, we will Discern the Difference between the Voice of Spirit and our own thoughts. AKBAL guides us into a Unity of Body and Soul so that our Human eyes will be opened to see the Light that is always shining in the darkness. AKBAL guides a journey within. We’re offered the courage to willingly enter the Darkness, where our eyes will grow accustomed to the Light that will lead the way. AKBAL holds the potential for mystical experiences. Our Heart will be opened to a Dream we left behind. We are guided to take a Leap of Faith to Believe in a Miracle. 10th UINAL: The Night/AKBAL trecena resides in the 10th Uinal of Manifestation. The Power to Manifest our Dreams will be magnified by two 10’s – the 10th Tone in the 10th Uinal. The Night/AKBAL trecena offers the Manifestation of our Highest Aspirations. 10 Road/EB in the 10th uinal multiplies a manifestation of our Divine Destiny to Abundance. The 10th uinal is the time of Blossoming. Our Beauty is the proof of Fruit to Come that will hold the Seeds of a new generation of Spirit. PORTAL DAYS: Element of Ether – The Night/AKBAL trecena includes 3 Portal Days that will thin the veil to other dimensions. These are magical days when we are capable to Experience our Spiritual Gifts. On 2 Seed/KAN a new Choice is offered to Dream, Knowing the Truth of our Divine Nature. On 7 Offering/MULUC a Portal will magnify the Consciousness of an Atonement with the Creator. A Portal magnifies the Dream of our Divine Destiny on 10 Road/EB. 6 Star/LAMAT – The Totem Rabbit will energize a Pattern of Movement that multiplies Abundance. 7 Offering/MULUC – Will offer Peak Energy for an experience of Atonement. 8 Dog/OC – Dog returns on the Holy Day, bearing the Divine Justice of Unconditional Love. 9 Monkey/CHUEN – The Monkey will offer Deeper Insight to a Dream of Creation. I invite you to share a Vision Quest. A Vision Quest is a “Dance in Spirit,” an Intention to Honor a Sacred Communion of Spirit. Through Consciousness of Time as a Sacred Ceremony, we call upon our Self to be “Here and Now” to be witness to a Miracle. We begin again. A new cycle of Transformation is led by the Spirit that speaks to us in our Dreams. The energies of this Tzolk’in round of 260-days are ramping up. The Night/AKBAL trecena will accelerate our Transformation through an evolution of Manifestation. Night/AKBAL leads a journey through the Void, the Darkness of the Unknown that holds Unlimited Possibility. AKBAL brings the Light of Spirit to show the way. Night/AKBAL offers the courage to face an unknown future by Healing our Fear of the Dark. The AKBAL glyph illustrates curtains drawn back to reveal the Light that is always shining. AKBAL connects the Vision of our Intellect with our Visions of Intuition and our Subconscious Dreams. The AKBAL glyph incorporates the familiar face of the Day Sign, Monkey/CHUEN. The affinity between Dog and Monkey, reveals itself again as the AKBAL trecena follows our Ascension from the Dog/OC trecena. 10th UINAL: The Night/AKBAL trecena resides in the 10th Uinal of Manifestation. The Power to Manifest our Dreams will be magnified by two 10’s – the 10th Tone in the 10th Uinal. The Night/AKBAL trecena offers a major manifestation of Spiritual Growth. The 10th Tone of Night/AKBAL is Road/EB, the Day Sign of Human and the Road of our Destiny. In the harvest cycle of transformation, the 10th uinal is the time of Blossoming. Our Beauty manifests the proof of Fruit to Come that will hold the Seeds of a new generation of Spirit. PORTAL DAYS: Element of Ether – The Night/AKBAL trecena includes 3 Portal Days that will thin the veil to other dimensions. These are magical days when we are capable to Experience our Spiritual Gifts. On 2 Seed/KAN an open channel will draw Truth to our Power of Creation. On 7 Offering/MULUC we will be Balanced in the Truth that our Power to Manifest is a Mutual Effort that is supported by Divine Agency. On 10 Road/EB a Portal will magnify Human’s Power to manifest our Dreams, on a day of two 10’s of manifestation. We are approaching a major milestone of Spirit and a Transformation to our Creative Power of Manifestation. On 1 Night/AKBAL we begin a new 13-day cycle of creation. Night will lead us on a Journey to the Void, the Place where all Potential Lies. Night/AKBAL offers Light to our Divine Destiny and Life Purpose, revealing the deepest desires of our Unconscious Self. We begin a journey that will guide us to throw out every notion of our limitation… to Dream the BIG Dream. Akbal empowers us with a limitless vision of who we are and what we may become. Over the course of the next 13-days, we will be guided to see how our dreams could really come true. PORTAL DAYS: Element of Ether – The Night/AKBAL trecena includes 3 Portal Days that will thin the veil to other dimensions. These are days when we are capable to Experience our Spiritual Gifts to feel the Presence of Divine Guidance that would guide us Dream a Bigger Dream of intention. On 2 Seed/KAN an open channel will draw Truth to our Power of Creation. On 7 Offering/MULUC we will be Balanced in the Truth that our Power to Manifest is a Mutual Effort that is supported by Divine Agency. On 10 Road/EB a Portal will help us see the Truth of a new manifestation. 10th UINAL: The Night/AKBAL trecena is held in the Higher Intention of the 10th Uinal of Manifestation. The Power of Tone 10 will be doubled by Uinal 10’s Higher Influence of Manifestation. 7 Offering/MULUC – Will offer Peak Energy for an experience of Oneness with the Creator. 9 Monkey/CHUEN – The Monkey will offer a Divine Perspective to Engage a New Transformation of Possibility. I’m grateful to Michael Shore, of MayanMajix.com for the kindness of inviting me to collaborate on a t-shirt project that features my glyph art. Ian Lungold’s teaching on MayanMajix.com was my first and most important connection to the Tzolk’in Calendar since 2002. It’s an Honor to share something back and to be a part of the MayanMajix.com community, shared by so many Daykeepers around the world. 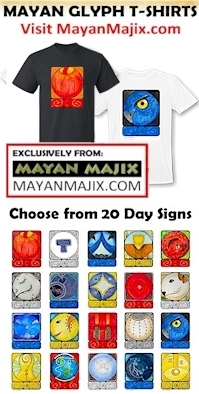 The MayanMajix.com Akbal Newsletter has announced the t-shirts are now set up and available in their online store! Sharing the announcement below. Thank you for checking them out. And, THANK YOU MIKE, for an opportunity to work together. These beautiful Mayan Day Signs T-shirts were painted in watercolor by Debra Malmos. We are so grateful that Debra said “YES” to our idea of printing them on T-shirts. You can feel Debra’s passion for the calendar in every colorful brush stroke. These full color Mayan Glyph t-shirts were originally painted in watercolor by Debra Malmos as her daily meditation to connect with the Tzolk’in. Over the course of 260 days, Debra evolved her paintings to these 20 master glyphs which we are proud to offer exclusively on Mayan Majix. We love how Debra has expressed her passion for the calendar with each brush stroke making this one of the most unique offerings on Mayan Majix. Debra Malmos, 9 Eagle/MEN, is a mystic and intuitive who shares her Daily Journal online as a contemporary Mayan Daykeeper. A Sacred Intention to Journal and Paint the glyph for each of the 260 Kin of the Tzolk’in was the inspiration for her Blog, Jaguar Spirit. As a way to return value to the Mayan community, a donation of 10% of the proceeds from each sale will benefit a Daykeeper in Guatemala.